You know it’s fall when you see everyone breaking out the scarves. And we’re all on the same page that fall fashion is the best fashion, am I right? And of the cozy knee socks, trendy tights, cute sweaters, and granny cardigans, the scarf is the reigning queen of all fall fashion. It’s warm, functional, trendy, and versatile. That’s why this large loop infinity scarf is going to be your go-to accessory for the cold weather months. I’m a big fan of infinity scarves because I don’t have to worry about them falling off or about hassling with tying them up. Infinity scarves are comforting, cute, and great for chilly days. 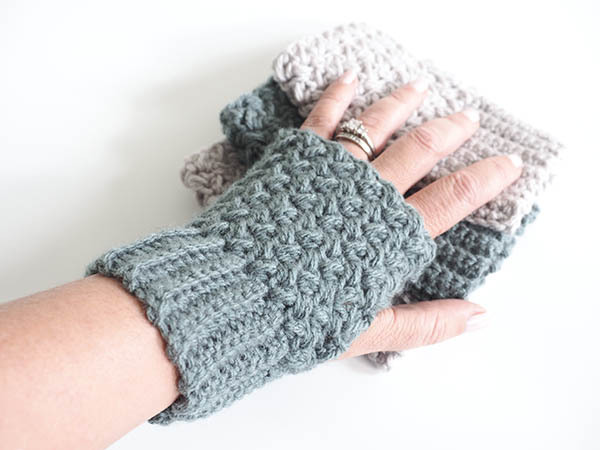 These use Size 4 Worsted Weight yarn, which means they crochet up fast. Because they’re relatively fast to make, these would be the perfect handmade Christmas gifts for the scarf lovers on your list. What color will you be making your scarf? Click here to purchase an ad-free PDF of this pattern for your convenience. This PDF pattern also provides you with a bonus crochet tips and tricks pdf. PATTERN NOTES: Both balls of yarn (2 strands) to be worked together throughout the pattern. If you would like your scarf longer, chain more than 110 stitches as long as it’s an even number. PATTERN: Using strands from both balls of yarn, make a slip knot and chain 110 (should be approx. 62”), without twisting the chain, slip stitch into the first chain to connect the ends and create a round. ROUND 1: Ch 4, skip chain space, *1 dc and ch1, skip space, repeat from * around and join with a sl. ROUND 2: Ch 4, 1 dc and ch 1 into the chain space below, repeat from * around, join with sl. ROUND 3 -16: Repeat Round 2. Click here to purchase an ad-free PDF of this pattern for your convenience. This PDF pattern also provides you with a bonus crochet tips and tricks pdf.